What is better than taking time off on a gorgeous summer day, finding a beautiful scenic park, or perfect spot on the beach, for a relaxing and romantic picnic in nature? Birds flying, gentle breezes, sunshine, and time to relax, unwind and enjoy the afternoon together! 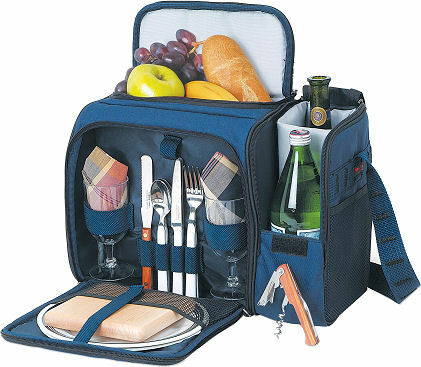 Our Picnic On The Go basket is very popular because it is elegant, compact and very functional. Clients not only choose it for a gift, they also choose it for themselves! It has many great features and comes with a complete service for two. It includes linen napkins, silverware, plates, wine glasses, bottle opener, cutting board, cheese knife, and wine glasses. It also has a place for two bottles (wine or sparkling cider) and an insulated compartment for the gourmet items. There is a pocket on both sides to put sunglasses, suntan lotion, extra snacks, etc. and it includes an comfortable shoulder strap. It comes in blue, burgundy, hunter green and black. This is also a popular corporate gift, and can be embroidered on the front with a company logo, website and phone number. We will tell you about some other popular choices in our next post.